The Browns Head Coach search is chugging along looking here and there and everywhere - except in the direction of recently chopped Lovie Smith. The fact that the Browns are ignoring Smith borders on the offensive. The first man the Browns’ Dynamic Duo of Jimmy Haslam and Joe Banner looked at was the Cardinals Defensive Coach Ray Horton. Interestingly enough, the Browns have narrowed their focus and expressed intentions to look in the direction of Offensive minds. And here is the interesting part; Horton is African-American, and enough to satisfy the Rooney Rule. Before we move further in my case for Lovie Smith, let’s talk about the Rooney Rule. The Rooney Rule is named for Dan Rooney, owner of the Pittsburgh Steelers. As chairman of the NFL’s diversity committee, Rooney saw the lack of diversity, primarily African-Americans, in leadership positions within the teams. In 2002, the rule he inspired went into effect, requiring teams to interview at least one minority candidate in head coaching searches. The Browns checked that box off with Horton and on to the real search, or so it would seem. All of the other candidates, all white by the way, are from the Offensive ilk. Doug Marrone (who went to Buffalo), Bill O'Brien (staying at Penn State), Josh McDaniels (announced he was staying in New England), Chip Kelly (wined and dined taking everyone for a ride and staying in Oregon complements of Nike) and the only other guy still in play - Ken Whisenhunt (fired from the Cardinals and still in play). So why interview Horton at all? If they were looking at a Defensive guy, who would you rather, Lovie Smith or Ray Horton? I think they interviewed Horton because he as there. In my mind, it is between Whisenhunt and Smith. Whisenhunt, while going to the Superbowl with Kurt Warner, has had a crap sandwich of an offense since then. Smith, also had a ball of poo for a QB, also went to the Superbowl, which is more astounding since he is considered a Defensive guy. I'm perfectly fine with interviewing either one...as long as we interview both. 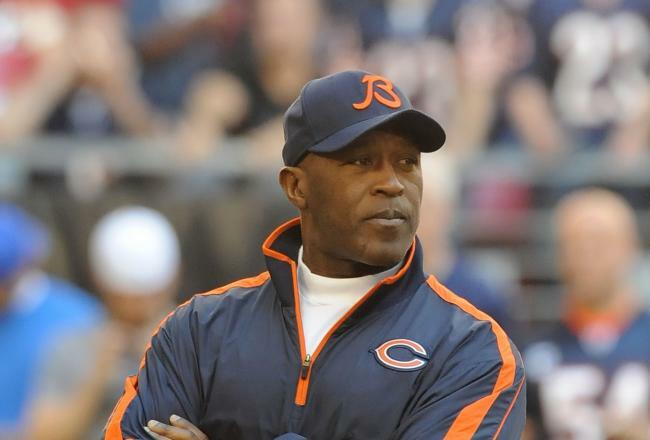 Ultimately though, I want Lovie Smith in Cleveland not only for his coaching ability, but also for his experience. The man has seen champions. He has been to championship games...when was the last time the Browns had a coach that could motivate the players? I cringed when the NFL Network showed Shurmur and his fired up speech after winning a game. It was embarrassing...but he hadn't won before, he isn't a winner and never knew how to deal with it.When pundits complain about Smith's record and him being a rehashed coach...think about another guy with almost the same record and a team in Indianapolis gave him a shot...Tony Dungy. Yes, Dungy had Manning, but a Peyton Manning is a once in a generation Hall of Fame guy. Just because Smith isn't an "Offensive" coach, it doesn't mean he doesn't get it. That is like saying even though I am fond of a filet wrapped in bacon that I don't know how to make a salad. Bring in a great Offensive Coordinator, maybe Bruce Arians, to groom him for the head coaching job. The point is, give Lovie a chance. We will regret it if we don't interview him. We waited 7 hours for Chip Kelly to stand us up... why not fly out to Chicago and meet him at Harry Carey's for a nice steak dinner? Who do you think the Browns are going to go with?